The second X-37B, also called the Orbital Test Vehicle, launched several hundred miles above Earth Saturday (March 5) on an Atlas 5 rocket from Cape Canaveral, Fla. It will stay into orbit for up to 270 days, according to Air Force officials. 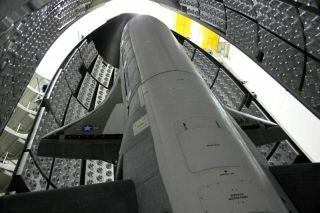 With short wings, V-shaped tail stabilizers and a landing gear, the X-37B space plane launches into orbit inside the nose cone of an Atlas rocket, opens cargo bay doors and unfurls a solar panel for up to nine months of operations, then returns to Earth with a fiery atmospheric re-entry and glides to a precise runway touchdown on autopilot.